Image: Poetry Jukebox, which is the first of its kind in Ireland was launched as part of the Belfast International Arts Festival in October 2017.
not to be at all. A Shadow Hid Me is the fourth edition of curated content on Ireland’s first-ever Poetry Jukebox and celebrates the contribution of Irish women to the canon of Irish poetry. As part of this year’s Belfast International Arts Festival, members of the public are invited to a free unveiling event, hosted by the FIRED! movement, at 6pm on Friday 2 November at the Crescent Arts Centre, Belfast, home of the Poetry Jukebox. 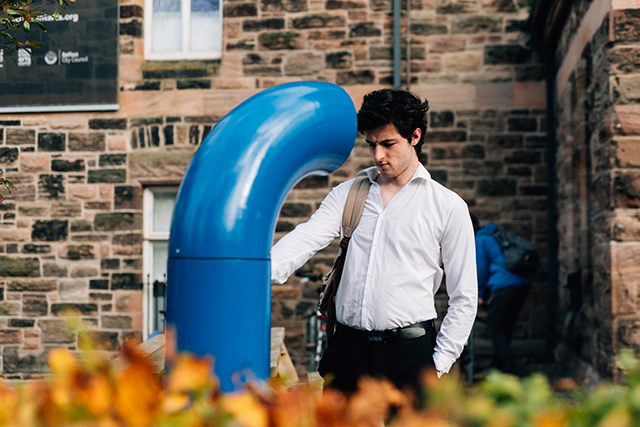 First launched at the 2017 Belfast international Arts Festival, the Poetry Jukebox is a free, on-street sound installation that provides an innovative platform for the public to listen to poetry by a variety of writers and is supported by National Lottery funding through the Arts Council of Northern Ireland. It is located in the grounds of The Crescent Arts Centre and the project is led by FIRED! Movement Artistic Director and poet, Maria McManus. This special event on Friday 2 November will mark one year of the Fired! movement, which started in Belfast in 2017 and has since travelled all over Ireland, and also to Barcelona. The new curation features 20 female poets reading poems and was compiled through a combination of open call and invitation. Join the event for readings and performances by leading Irish poets, including Moyra Donaldson, Siobhan Campbell, Chris Murray, Alex Pryce, Maureen Boyle, Maria McManus and many more.